Wedding Bells are ringing for Kapoor family! 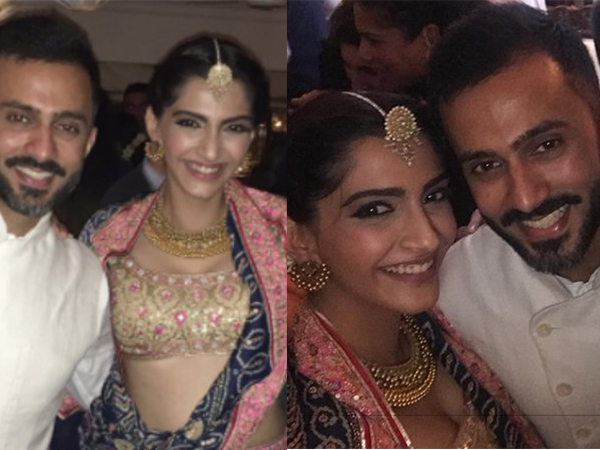 Bollywood’s versatile actress Sonam Kapoor and Anand Ahuja are two of the most trending celebrities these days due to their wedding, which is to take place on Tuesday i.e. May 08, 2018. With the official confirmation from both the families which stated, “The Kapoor and Ahuja families, take great joy and pride, in announcing the marriage of Sonam and Anand. The wedding will take place on the 8th of May in Mumbai. Since it is an intimate affair, we request you to respect the family’s need for privacy. Thank you for all your blessings and love, as we celebrate this special moment in our lives”, the excitement among their friends, and relatives has been increasing manifold. Of course, for fans of Sonam Kapoor, who have been eagerly waiting for this to happen- the big day has finally arrived! Just yesterday, at the Kapoor residence, Sonam Kapoor’s Mehendi Ceremony took place, and Bollywood biggies was seen putting on their best attires and heading to the Kapoor house for the celebrations. Donned in a pastel pink coloured dress, with henna on her hands, Khoobsurat actress Sonam was looking really beautiful. And now, after the mehendi, everyone is eagerly waiting for the tomorrow (Wedding Day). We all are very well aware that a shaadi (marriage) is not just a union of two souls and families, but it goes beyond that for the soul partners. There are so many expectations and dreams and not to mention, compromises as well, after all what is love without some compromise. As for Sonam and Anand, there would be one rule that the both of them would have to abide by. To a leading online portal, Sonam was quoted as saying, “It’s a rule basically Anand has put on both of us. Right before I sleep I have to put my phone on charging in the bathroom or I charge it in the hall of other room”. Well, this seems to be a good rule, right? In a world, so much obsessed with screenshot, selfies and posting every picture with hashtags lovegoals, relaionshipgoals and many more, doing away with your phones, at least before hitting the bed, is the best thing. Reports suggest that Veere Di Wedding actress Sonam Kapoor, and her entrepreneur soon-to-be husband Anand Ahuja, would shift to Notting Hill, London after their wedding where the couple have already bought an apartment. Sonam would keep travelling back and forth for her professional commitments in India. Well congratulations and heartiest wishes to the lovely couple!